If there is at least one place in the world where subtle romance mixes with fabulous luxury, riveting history and plush art, it would definitely be France, the centre of pageantry and fashion. In the very heart of the country, in Paris, there is the fashion house that represents the main peculiarities and beliefs of this gripping country – the House of Givenchy. It stands out in at the background of other brands by its aristocratism, expensive materials and inimitability in its beauty design. In addition to that, Givenchy was the first designer who began creating his models not only for fashion shows but also for mass production. Thus, he was the first one to use the term ‘Prêt-à-Porter’. As a result, the 50s – 60s years were called ‘The era of Givenchy’. The House of Givenchy was founded in 1952 by Hubert de Givenchy, a young gifted designer who was only 25 years old at that moment. Since that moment Givenchy is recognised throughout the world as one of the best fashion standards due to its history, taste and unique French charm. His first Autumn-Winter collection of 1952 – 1953 marked the starting point for the triumph of the then young and promising brand. Because of the lack of money, his first collection was made out of men’s white shirt material. Still it didn’t stop it from gaining success and recognition. In 1957, genius Hubert Givenchy together with the irresistible Audrey Hepburn launched a perfume line called L`Interdit. It caused a sensation in the fashion world symbolising the extreme sophistication and overwhelming desire that were both typical for the famous actress and for the new fragrance. The first clothes line for men, Gentlemen Givenchy, was launched in 1969, marking the moment when Givenchy became popular not only among women but also among men. The famous Givenchy logo soaked with a deep symbolism of number 4 was created by Pierre Dinand in 1970. Hard work, strict order, eternal loyalty and indisputable solidity are the life mottos that the brand is guided by. In 1989 the brand started producing cosmetics, thus becoming even closer to the beauty industry. A wonderful Givenchy spa was opened in 1991 in an attempt to bring more comfort and beauty to women’s lives. Currently the brand belongs to the luxury group LVMH. Kenzo, Dior, Emilio Pucci and Louis Vuitton are also some of the successful and prestigious fashion brands of this conglomerate. Givenchy continues to create new milestones in the world of fashion under the able leadership of Riccardo Tisci, as the brand’s Creative Director. Tisci took over the reigns of the company and replaced Monsieur Givenchy when he had retired. Under his guidance, Givenchy continues the tradition of of making breathtaking clothes, perfume and accessories. Riccardo Tisci is also credited with the launch of new products under the brand, that keep in step with time including necessary accessories such as eyewear. There’s no secret that such a special and successful brand had to be inspired by someone remarkable and affluent as well. When Hubert de Givenchy was 26, he met the woman who probably changed his life forever. She didn’t become his wife or his lover. However, she became his closest friend and his preferred muse. It was no surprise that she therefore escalated to becoming one of the most important women in his life. Presidents’ wives, duchesses and queens considered it an honour to get their dresses and accessories at Givenchy but he created his chefs d’oeuvres devoting them only to one woman. Her name was Audrey Hepburn. She came to him being a young unknown American actress looking for some suitable costumes for her character in the movie ‘Sabrina’. Subsequently this movie received only one Oscar – for costumes. Later on Hubert de Givenchy confessed he considered Audrey to be an ideal image of the woman he wanted to create dresses for. The mere mention of the name Audrey Hepburn brings back an image of a beautiful lady wearing a long black dress and beautiful pearls. Of course, Audrey Hepburn reached out to many in her enchanting avatar as the uptown girl in ‘Breakfast At Tiffany’s’. However, in addition to her acting, it was also her outfit that completed her beautiful look. The popularity that she achieved also helped Givenchy get more prominence. It’s even hard to understand who did a better favour: Audrey for Hubert or Hubert for Audrey. Still, Audrey was not the only person who chose Givenchy among all other designers. Jacqueline Kennedy, Grace Kelly, Greta Garbo and Elizabeth Taylor also declared their love to Givenchy wearing his dresses and accessories. Givenchy doesn’t need flashy elements or unusual decoration to create an unforgettable impression. As Hubert de Givenchy is known to have always said, the truth is concealed in simplicity. Even after the founder of the fashion house retired, the brand decided not to betray his beliefs. That’s the reason you will hardly find loud details on the Givenchy eyewear. This is perhaps the most distinguished trait of this brand. Every Givenchy eyewear collection demonstrates the brand’s high fashion history that is beautifully concealed in intricate details. Givenchy eyewear introduces a new style for the Spring Summer 2017 a 200-pieces limited edition. These oversized ‘Givenchy Square’ sunglasses present a structure in havana or black acetate enriched by genuine gold or silver stingray cover. The shagreen leather details recall Givenchy’s long-term expertise in leather treatment. Colour palette: dark Havana and gold metallic stingray leather; black and silver metallic stingray leather. The limited edition style will be available at Givenchy boutiques, quality department stores and high-end opticians. GV7016/S/N ‘Givenchy Staple’ (square frame) and GV7017/S/N ‘Givenchy Bridges’ (round frame). These unisex models feature a metallic structure with a bold rubber over-injection. Inspired by the conceptual leanings of its founder, every Givenchy product continues to be infused with keen precision and imagination that sets it apart from the others. 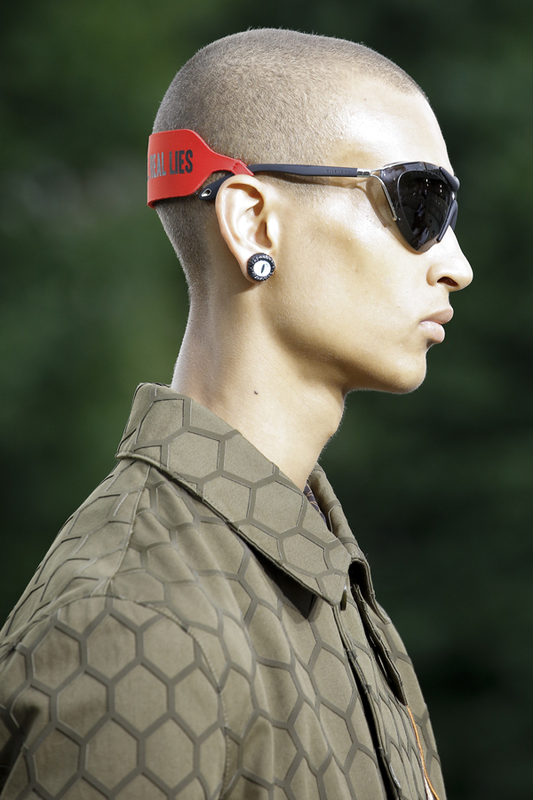 While you are at it, these the oversized ‘ Givenchy Square’ sunglasses cannot be missed. These present a structure in havana or black acetate enriched by genuine gold or silver stingray cover. The shagreen leather details recall Givenchy’s long-term expertise in leather treatment. New highlights from Givenchy also include: retro-inspired rounded silhouettes with an essential design reinterpreted with an original twist. bold acetate or ultra-lightweight metal, as in Givenchy.